Cat detection is not a trivial task, especially if you want to perform it on ARM devices. Before using the following cascades read carefully this page to get the best performance and to know the terms of usage. *NEWS*: since June 2016 vision-ary project joined ARGO Vision, an innovative firm that excels in visual recognition. For inquiry about cascades and more, please contact ARGO Vision. Interesting exercise about visual recognition. The idea is good and applicable to others interesting use cases. you’re right: in the next days I’ll complete the pedestrians cascades (HOG, LBP) and in the next weeks I’ll share other cascades for visual recognition. The ultimate goal is handling a wide range of “in-the-wild” objects, directly on ARM devices. I’m interested in detecting cat and dog faces. Could I use your haar or lbp cascades or should I make my own ? Is that all that is necessary ? the cascade is able to detect the cat’s face, you can build a binary cascade able to do the same about dogs. How can we help you? Are the numbers you report based on the training dataset? Can you show your results on some standard pet recognition datasets like asirra or oxford-IIIt? this cascade is just for teaching purposes. No ambitions about products, there is no benchmark about the datasets you cited. I was wondering whether it’s possible to differentiate between multiple cats? 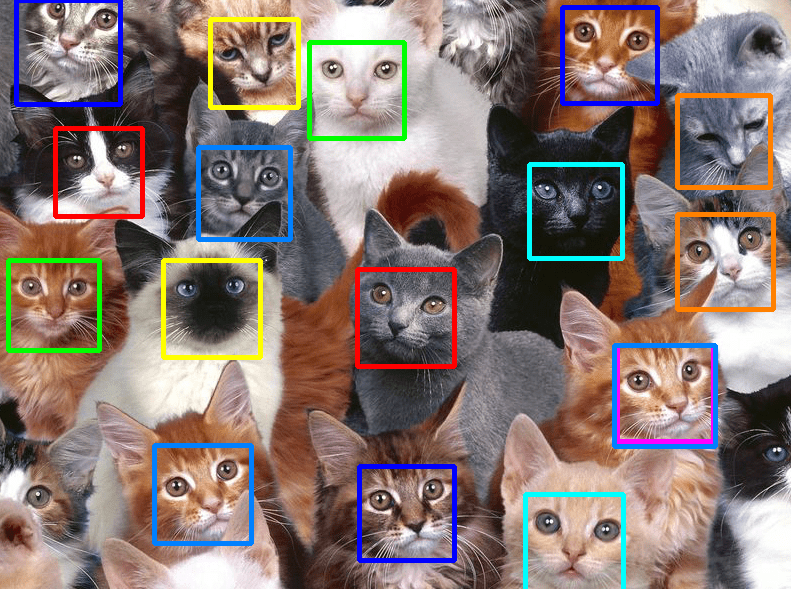 Can each cat’s unique features be tracked? question 1: of course it is but not with this kind of cascades. We can suggest to use a neural network or a multi-class “old school” classifiers. Question 2: basically yes, it is possible to track the cat’s features (after a cat has been detected). Hi! i cant import different xml files on my c# project. I have visual studio 2015 and i am using emgu cv for this. Last week, i classified a dataset(25000 dogs and cats image) training time : 4 days. i created a xml file but i cant use it. if there is different ways to solve this problem i can choose that way. — i have a project. Its simple : Detect cats or dogs? Can you help me please?